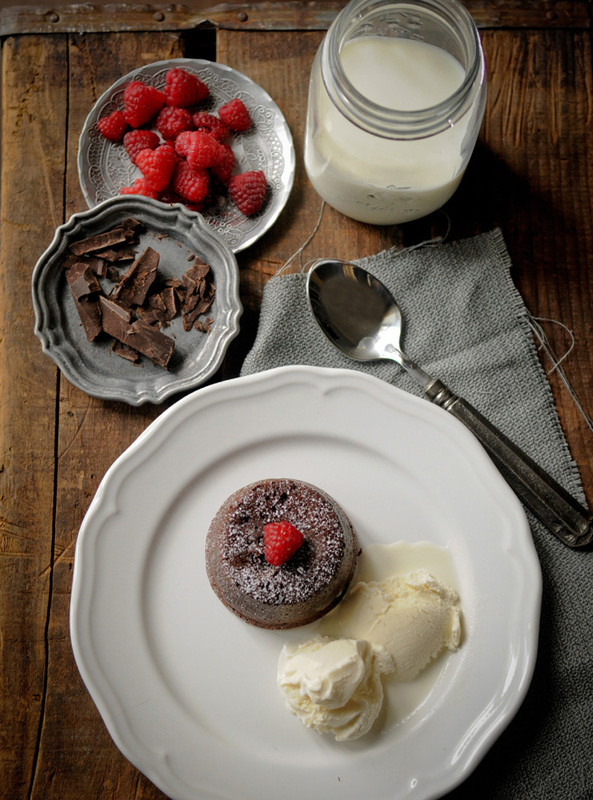 Molten Chocolate Cakes — potato chips are not dinner. I moved to Paris in 2007 under the impression that I knew French. I have probably never been more wrong about anything. Every American-accent drowned sentence attempts I uttered were met with English responses. Discouraged, I regressed into a shoulder-slumping mumbler and speechless menu tapper (thankfully there is a metro station on every corner of that city because I'd have preferred to have gotten lost than ask for directions). Until, it so happens, I stepped into a Patisserie or it was time to order dessert. Chocolate, in French, just happens to be chocolat. Pressing the bouncy center ever so slightly with the back of my spoon before letting the luscious chocolate center flow into the melting ice cream. Making sure to get equal amounts of warm cake, warm chocolate ganache, cold vanilla ice cream, and tart raspberries on that spoon of mine. Find me a superior dessert, I dare you. What makes this recipe extra special are the milk chocolate squares placed in the ramekin just before baking. Preheat your oven to 400 degrees and grease your ramekins well with butter. This ensures your cake will not stick to the sides. Coarsely chop your chocolate into small pieces. Melt your butter, then stir in your 8 ounces of chocolate until it's completely melted. Stir in eggs, egg yolks, vanilla, milk, powdered sugar, salt and cake flour. Fill your ramekins half full with batter, place 2 squares of milk chocolate in the center, spoon more batter on top. Bake for 12 minutes. Cool for 10 minutes, and carefully run a butter knife around the edge of the ramekin to loosen the cake. Invert on a plate, dust with powdered sugar. Garnish with raspberries and a scoop of your favorite ice cream. A big glass of cold milk can't hurt, either. 1/2 cup plus 1 tablespoon cake flour. 1. Preheat your oven to 400 degrees and grease your ramekins well with butter. This ensures your cake will not stick to the sides. 2. Coarsely chop your chocolate into small pieces. Melt your butter, then stir in your 8 ounces of chocolate until it's completely melted. 3. Stir in eggs, egg yolks, vanilla, milk, powdered sugar, salt and cake flour. 4. Fill your ramekins half full with batter, place 2 squares of milk chocolate in the center, spoon more batter on top. 5. Bake for 12 minutes. Cool for 10 minutes, and carefully run a butter knife around the edge of the ramekin to loosen the cake. Invert on a plate, dust with powdered sugar.